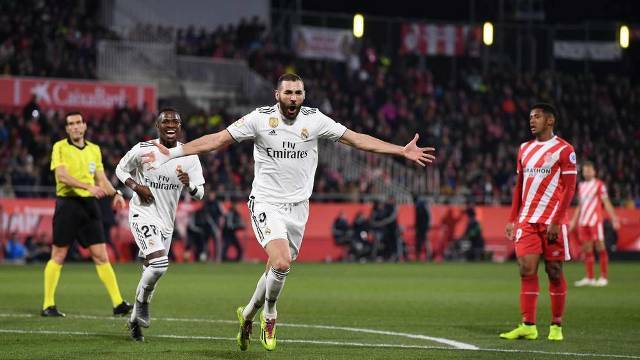 Agency, 1 February : Karim Benzema scored twice to move up to sixth in Real Madrid’s all-time top goalscorers as his side beat Girona to reach the Copa del Rey semi-finals. Real won the first leg 4-2 and extended their lead in the 27th minute when Benzema curled the ball into the net. Benzema scored his second of the match just before half-time, striking low into the bottom corner when unmarked. Pedro Porro pulled one back for Girona, but Marcos Llorente added a third goal for the visitors from 25 yards. Wales forward Gareth Bale came on as a substitute and played the final 23 minutes for Real. It finished 3-1 in the second leg with Real, who last lifted the trophy in 2014, winning 7-3 on aggregate. Benzema, 31, has played 446 games for Los Blancos since his £30m move from Lyon in July 2009 and has scored 209 times in total, comprising 136 La Liga goals, 47 in the Champions League, 20 in the Copa del Rey, three in the Club World Cup, two in the Spanish Super Cup and one in the European Super Cup. Real join holders Barcelona, Valencia and Real Betis in February’s two-legged semi-finals with the draw taking place on Friday.